I sanded and painted many hours this week. I used epoxy mixed with fairing thickeners to fill seam and voids that I wanted to smooth out. This created a lot of time consuming sanding. Even though this stuff is ‘designed’ for sanding, it was hard going and came off very slowly. I finally gave in and started using patching compound for wood and wall board to get the final smoothness before my final primer coats. The primer coats where applied with a small brush and paint roller. I am using System Three Primer. 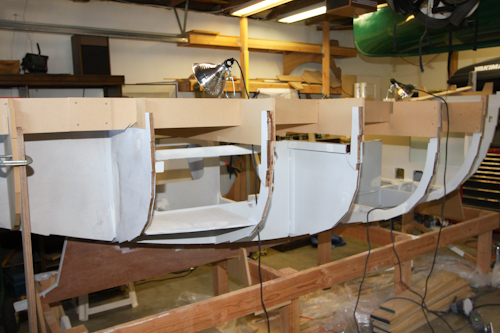 The smooth finish I desire is finally there and after one or two more coats of primer and an inspection, it will be time to flip the boat over and start the hull planking. I will be buying the plywood next week for cutting out the hull planks. I have also started work on the rudder. It must smell like heck with the epoxy and the paint. Thank you for your help this weekend. Not much smell from the epoxy paint, but a lot of latex smell from the bathroom remodel.